Get creative with promotion. Interview a Yeti! It’s that time of year we are recruiting students to sign up for our winter camp. It’s been really neat to watch our camp grow by about 20% each year. Although this is cool we want to keep things fresh. How can you take camp promotion to the next level? This year we interviewed a Yeti! Despite the language barrier, it went over really well. We showed this commercial in the main auditorium to encourage parents to sign their kids up. There was lots of laughing and a buzz about how well it was composed. Sure, it took some extra time to make this happen and I stepped outside of my weekly routine of things – but it was SO worth it! What have been your most successful recruiting/promotion strategies? Share your ideas in the comment section below! Checking for leaks in your ministry. I’m in the trenches of dumping money into my truck for maintenance issues. At this point I’m ready to wipe my hands clean and start again with another vehicle, which will come with it’s own problems I’m sure…sadly that’s how cars are unless you can buy a new one every year. So, how did I know my truck needed maintenance? I spotted it one evening after an oil change. Thinking it was residual oil I kept an eye on the leak…it got bigger overnight. A day or two after watching it and looking for the source I found it was something bigger, which lead to another repair needing to be made. I think you might see where I’m going with this so I’ll jump out of the analogy and speak straightforward as a pastor and leader overseeing many. I’m in the people business. Just as a mechanic knows cars because they have been around their fair share of vehicles, I know people. In student ministry I deal with teenagers, college aged leaders, adult leaders and parents…pretty much the entire gamut. When you work daily with various age groups you are constantly troubleshooting problems, re-arranging leaders, consoling a depressed student, or listening to an irate parent. What do all of these people have in common? Maintenance and maintenance indicators. Just as a warning light would display low fuel, or low tire pressure, people do the same thing. 4 reasons why you won’t register for the Orange Conference. 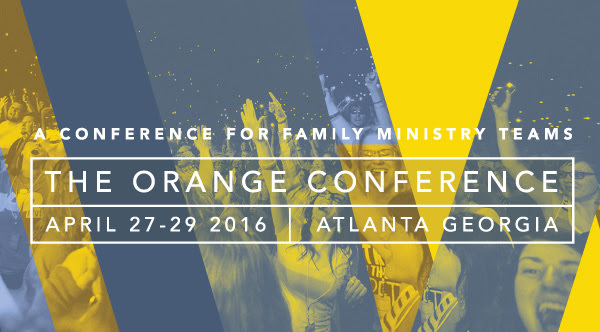 Theme revealed for Orange Conference 2016! MONDAY is when reality hits. MONDAY is when Sunday is tested. MONDAY is when faith has to work. Monday is a big deal for students, it can make or break their week. It’s the day that they forgot they had that test, their girlfriend dumped them, they got cut to second string on the team. Monday is the day the student enters back into “real life” the reality that the weekend isn’t going to last forever and the hat of responsibility must be worn well to succeed in school, sports, friendships, etc. Monday is an important day and I couldn’t be more thrilled that we will aim at this day of the week during the Orange Conference. Join me and the thousands of others that have committed to love the next generation with the love of Jesus. Let’s learn together. I hope to see you there! Registration opens this Thursday, October 8. Set a reminder now to register on opening day and save $80 off regular rates + get INSIDER FIRST ACCESS to breakouts! FOR ONE DAY ONLY! Before you get all fired up about changing your program time… here’s the best advice I can give you, approach this change with a level head, humility and above all perseverance. Going about making a change like this can upset a lot of people and you have the potential of losing students and parents. While all these thoughts haunted me for a few minutes, sure enough, every student and more showed up to our new program time! This begs a couple questions that every youth pastor asks in this area: Why should I change my program time? How should I go about changing my program time? We wanted to maximize our potential to reach more students. We wanted to better partner with the parents, a more optimal drop-off and pick-up time. We wanted to maximize relational time on the back end of program. We wanted to protect our staff and key volunteers, this new time would help prevent burnout. Make a good pitch to your manager or staff that need to be involved. Cast vision to your leaders first and make sure they are on board. Conduct a parent/leader survey with the time options you are considering. Write an email to your whole parent roster making them aware of a potential change, months ahead of time. Pilot (don’t commit yet) the new program time for two-three months to help people adjust the idea, this is a true litmus test to see if people are willing. Send out a formal email updating staff, parents and student on the time change and when it will officially take place. Market the heck out of your new time via social media, celebrate it, make it fun. 3 years ago when I inherited our HS group, we met on Wednesday nights. Through a survey and checking school practice/game schedules I knew I could not reach the same amount of students if we kept meeting on Wednesday nights. I wanted to move it to the time with the least amount of competition for school and family schedules, this lead me to Sunday afternoons…through a series of hoops with leadership I had to jump through (you know how that goes) I compromised to meet on Sunday nights 6pm-8pm. This was ending a bit late for students on school night and not what I wanted originally….something about program ending after dark does something to parents physiologically I believe. They don’t want to get out to pick up kids after dark. For freshmen and underclassmen, we saw parents wanted them home before dark on a school night. After a year of doing the things listed above, we have arrived at a 4pm-6pm program time for high school students on Sunday afternoons. I copied the young life idea of doing something fun with the time…we meet at 3:59pm, this encourages them to be on time and it’s memorable. Ending at this time on a Sunday allows our students and leaders to capitalize on hangout and relationship building via one off hangouts directly after church. Students are doing it and I myself have already taken advantage of hanging out with leaders after a program, going to the lake for a swim, out for ice cream, etc. A book that helped me lead the charge on making this change along with other major shifts in student ministry was a book by Carey Nieuwhof, thanks so much Carey for this book…it gave me the courage, boldness and perseverance to press forward in sticking to my convictions and persevering until there was resolution. You can get Carey’s book here…it’s a quick read and I recommend it for any church or business that are considering making a change. Any questions on program times? Best practices you have used in making a change? What have been some of your best tactics or worse failures you have learned from along the way? Develop a social media plan. Communicate and communicate often across all platforms. Hootsuite, Onlypult, Buffer. These are some tools you can use to develop a social media plan. Schedule posts ahead of time so if you have a busy season of ministry stuff is still getting out there. Get mom and dad on board. Introducing yourself to the parents is worth its weight in gold. When parents know who you are and who their kids are being influenced by, it is much more likely they will bring their kid back to youth group. If not you, rally your leaders to introduce themselves to mom or dad during drop off or pick up. Send a follow up email directly to the parents welcoming them to your church. Be willing to change your program time. I didn’t say change your program time…be willing. Wednesday night youth group is fading out. Only churches that have been doing this a long time may have a culture of it…is it most likely poised for reaching new kids? I’d argue the answer is no. Conducting surveys of families and most available times can help you offer the least competitive time for students to attend youth group in your area. My high school students gather on Sunday evenings from 4pm-6pm. There are no school conflicts and it allows them to be home earlier on a school night (which most parents are fond of). I share more about this idea in another post. Create a space for students to call their own. Students care about ownership, they like the club idea, a place to belong… a safe haven with cool vibes. Not everyone understands this nor do I expect it of them. My youth group operates in a shared space…a couple of shared spaces. I make it my aim to make this space appealing to students. There are probably a hundred ways to do this…even in a shared space. Creativity is king and sky is the limit. Start with that mentality and see where you end up, probably in a better place than you are now. I can give you a virtual tour and talk through our shared space and some practices we use every week, anyone interested? Stay tuned. How have you made your youth group more accessible? What does your visitor follow up process look like? Let’s hear it! Disciple: Be One. Make One. We are all familiar with the great commission. Especially during mission trips, we let the words of Jesus be a beckoning for students and adults to participate…”GO! And make disciples of all nations…” yet we also understand this should not be merely a seasonal advertisement at the local department store. Let the words sink in…GO….MAKE DISCIPLES….OF ALL NATIONS. There is nothing in the phrases of Jesus that reduce the vision to a short-term trip, it’s communicated as a directive in lifestyle and mission. The aim. Jesus asked his disciples and followers to make this their aim and let everything else fall into place…the cost of following Christ is great. In the days of the early church roots it meant leaving your home, not continuing in the family business, traveling great distances to spread the word. The aim was clear. This mantra of “Disciple: Be One. Make One.” was introduced to me by my youth pastor (Bobby Pruitt/love that guy), it was the slogan of our youth group in which we clarified all activities, retreats and new opportunities through. We were challenged constantly about our “aim” and if it truly was our aim to be a disciple of Christ and if we were living on mission to make other disciples. Confession. The more I have become involved with vocational ministry the harder it seems to make this my aim. I find myself doing “good” things for the kingdom: recruiting and training leaders, preaching to MS and HS students, creating momentum for parents to feel the support of the church, bettering our environments for kids and students, and dreaming big dreams for the next generation…. but this is not discipleship. Here’s my personal conviction. Over the years in vocational ministry I have had seasons of intentional discipleship. Sometimes I am being intentional to disciple a leader and a student, other times just a student but still other times nobody…zilch, nada, none – but man oh man, that camp we did was awesome! Today I meet with Zach. He’s a middle school small group leader in my ministry. We have been discussing the holy spirit and prayer and will continue down that road for a few weeks. Let me set the record straight by saying Zach reached out to me, not the other way around. It was a conviction moment when he asked, “Would you disciple me?” I quickly answered yes because I knew I needed too…but deep down I quickly went to the craziness of my to-do list to see where this might “fit-in”. Sad. Make it your aim to disciple someone…always. Never be too busy that a discipleship relationship would take precedent over other important things your church deems as important. If you want your church, your ministry, your flock to be disciples that are making disciples then you need to set the pace for them. So, I leave you with these questions to wrestle with and pray over today. Who will you ask to hold you accountable to discipling others? An answer to prayer – the Gateway Leadership Development Program. It is my privilege to announce that on the tenth day in September in the two thousand and fifteenth year of our Lord that a leadership development program started at Gateway Church in Austin, TX! I’ve been waiting since I came on staff for this…over the past few months as this program was discussed and approved I quickly began searching for some potential LDPs that may want to spend a year learning in student ministry, as this kind of opportunity greatly shaped who I am today. They are here now and I couldn’t be happier! Kristen Johnson (a former student of mine and current Moody Bible student) and Kelli Woody (a die hard Kamp Kanakuk counselor) will be joining the student ministry staff and volunteers for a year. Learning will be had by all the LDPs in the various ministry areas at Gateway along with all of their managers. This will be a first for me…it seems like I’ve always been the intern or in a program but I’m excited to teach what I can and share with them in the learning experience this year. Here’s the neatest part. One of the things I’ve been trusting God for this year and fervent in prayer was for another full-time staff for student ministry…well in some ways he gave me two. Yes, I’m still praying that we can hire another full-time staff in the near future but for now I’m ecstatic these two ladies will be joining our ministry this year. Welcome Kelli and Kristen! If you want to read more about the opportunity here, the door will open back up in Spring for applications for the following school year.